I discovered on Wednesday that Rottefella’s careful qualification of the releasability of their NTN telemark bindings is well-justified. I was skiing the resort of Coronet Peak, New Zealand, when a tentative approach to a short but ugly-looking steep off-piste slope led to a twisting fall. My ski stopped, my body kept going. In one of those slow motion moments, as the tissue began to tear, I kept expecting the binding to release, but it never did. The result was a debilitating ankle sprain, but no broken bones. My first serious ski injury in 30 years of skiing. The photo was taken two days after the accident when swelling was maximum and black patches had appeared; presumably the accumulation of previous days’ internal bleeding. 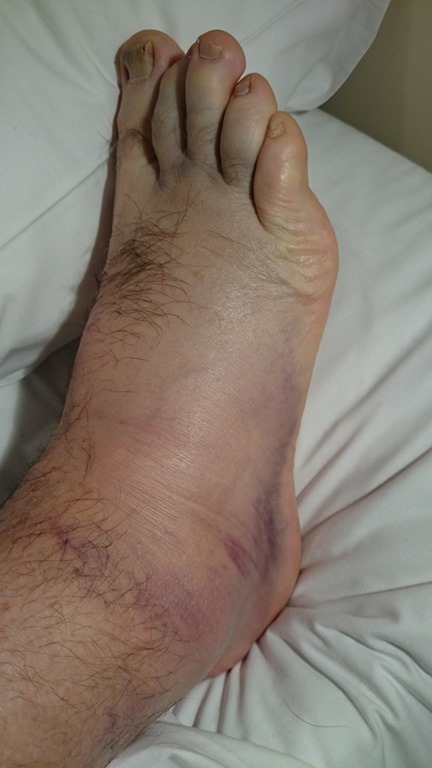 UPDATE, Oct 2014: Turns out I fractured my fibula, quite seriously. Diagnosed after five weeks, which included a couple of attempts to ski and other ill-advised activity, the recovery has been prolonged. Have today concluded that I will not be able to head away on a ski tour planned for 10 weeks after injury. UPDATE, July 2015: Fracture led to cancellation of New Year ski trip to Japan. Finally got right for a ski tour week in British Columbia in April 2015. Only last month, 10 months after the injury, was I able to get my trail running out to 2 hour sessions. Even now, niggles and pain persist. I’m only saying this to emphasise how disruptive an injury can be to those who haven’t been through it. Best avoided! Don’t expect any telemark binding to release when you need it to. Although I mainly ski advanced off-piste terrain, my technical ability is limited and I frequently find myself surrendering to trepidation with hasty and clumsy turns. The limitations of my technique are probably a more important factor than the requirement to keep skis attached in steep and exposed situations. Therefore a reduction in release setting is wise. Ironically, my injury forced the cancellation of a scheduled telemark lesson. The main reason for my preference for a release mechanism in telemark bindings is the concern about the consequences of being caught in an avalanche. For that reason alone, I will continue to choose telemark bindings with some form of safety release. The Rottefella Freedom has a nice telemark flex action, effectively transfers power from boot to ski, is convenient to enter and exit, has ski brakes and has a limited release function. Overall, I am satisfied with this binding.